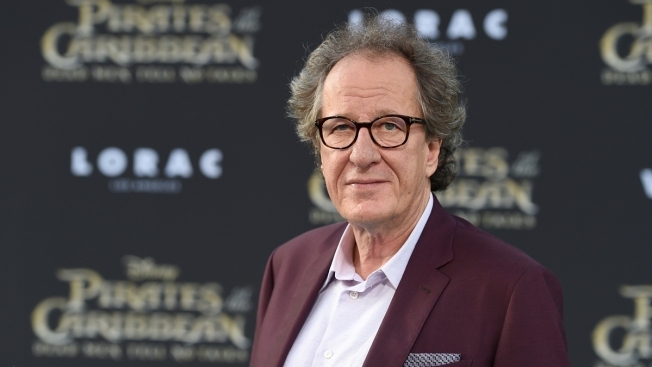 The actress at the center of Oscar-winning actor Geoffrey Rush's defamation suit against a Sydney newspaper alleged he touched her breast and lower back during a Shakespeare production three years ago, documents presented in court said Thursday. The 67-year-old Australian actor is suing The Daily Telegraph in the Federal Court over articles in December that reported Sydney Theatre Company had received a complaint of "inappropriate behavior" against Rush during a production of "King Lear" in 2015. The company said the actress who complained had requested anonymity and had not wanted Rush informed. Justice Michael Wigney was told on Thursday that the newspaper would use Norvill's statement in its defense against the defamation suit, which is to be tried by a jury in October. Both Rush and Norvill are expected to testify. The newspaper's defense will include allegations Rush's hand "traced across" the side of Norvill's breast during a performance. Rush has denied any inappropriate behavior. Rush's lawyer, Sue Chrysanthou, criticized the newspaper for publishing the original articles without speaking to Norvill. "They did publish two front-page articles accusing my client of sexual misconduct when they had nothing," Chrysanthou said. The newspaper's lawyer, Alec Leopold, said his legal team was searching for witnesses to corroborate what Norvill said. He said the nature of the allegations and Rush's "position in the acting world" meant not everyone wanted to speak about the claims. He won the 1997 best actor Academy Award for "Shine" and has three other Oscar nominations. He is perhaps best known as Captain Barbossa in the "Pirates of the Caribbean" films.